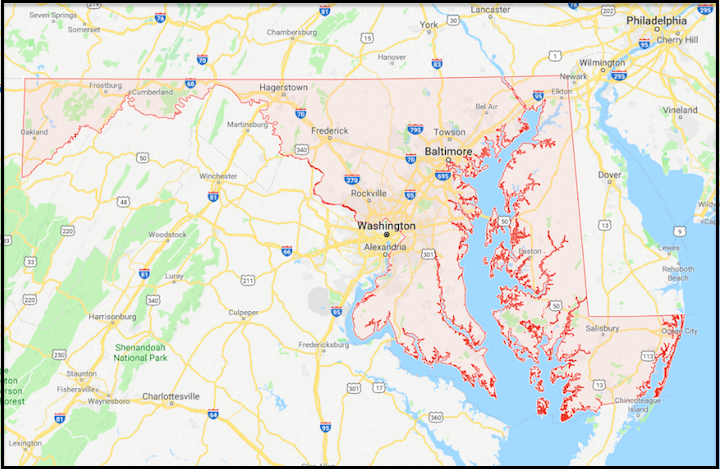 Scroll down for a free printable Map Of Maryland cities, along with another map illustrating counties throughout the state. 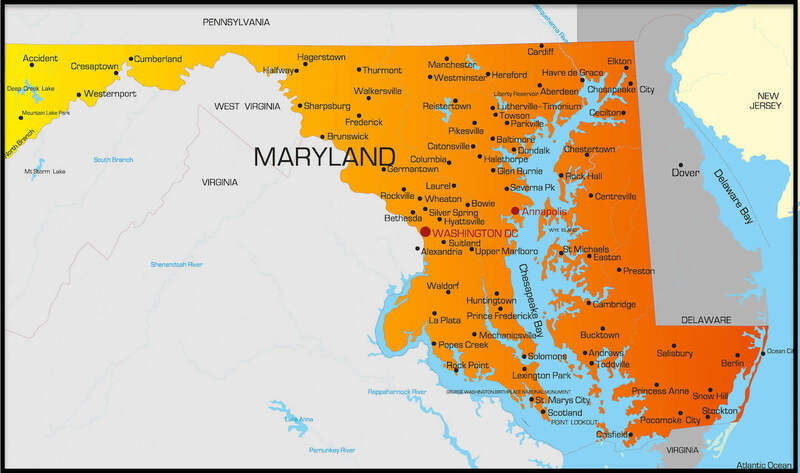 The above US map shows the location of the state of Maryland in relation to other US states. 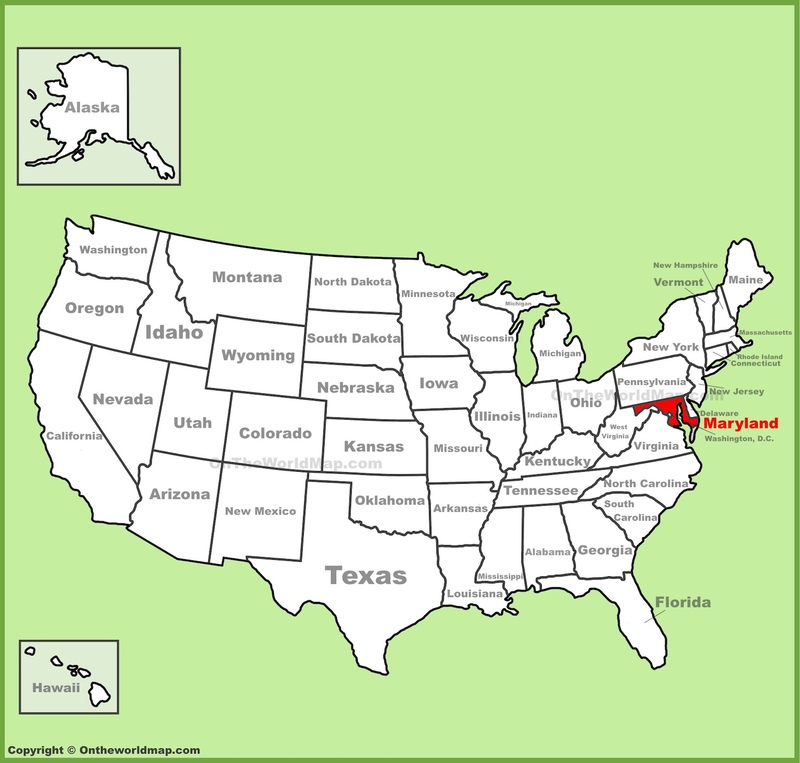 On April 28th of 1788, Maryland became the 7th state admitted to the Union. Scroll down for fascinating facts about the state of Maryland, and related links to other free printable items. The first railroad train station was built in Baltimore, Maryland in 1830. The US Naval Academy was founded in the city of Annapolis on October 10th, 1845. The Maryland Gazette, established in 1727, is the oldest continuously published newspaper in America. Assateague Island features a herd of feral ponies who draw millions of tourists annually. St. John's College in Annapolis was originally called King Williams School, established in 1769 as the first school in America. Maryland gave up some of its land to help form Washington DC. The University of Maryland offered America's first Doctor of Dental Medicine (DDM) degree in 1840. The Baltimore Water Company was the first water company in America, established in 1792. Johns Hopkins School of Medicine in Baltimore graduated America's first female doctor in 1901. In 1902, Maryland became the first state to enact Workmen's Compensation laws. Above: A printable map of Maryland cities.